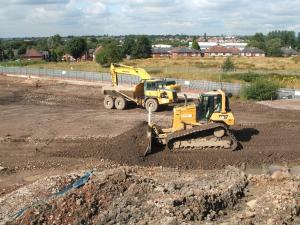 VertaseFLI was contracted by Northern Trust to undertake remediation and earthworks at the former BP Castrol Site in Hyde, Manchester, prior to redevelopment for residential end use including gardens. Site investigation works across the site had identified elevated concentrations of hydrocarbons and metals associated with the sites’ former use as oil storage and processing depot and foundry. The remedial actions were required to facilitate the safe restoration of the site to enable development for residential end use. The work involved the turnover of the site to natural ground (clay) to ensure all below ground structures were removed and contamination was identified. Hydrocarbon contamination encountered during turnover was treated by ex-situ bioremediation. One area of site prior to turnover was treated by Soil Vapour Extraction (SVE) to minimise the risk of chlorinated solvent vapours being released during turnover to reduce any potential nuisance to the adjacent college. Several large underground storage tanks and the former water treatment works were cleaned, excavated and disposed offsite to an appropriately licenced facility. All materials were then classified and reinstated to an agreed compaction specification in accordance with Highways 600. The remediation of the site presented a number of significant challenges due to the close proximity of the railway, residential properties, two schools and the weather. Due to extreme rainfall, lime stabilisation was carried out to improve the moisture content of some excavated material prior to reinstatement. 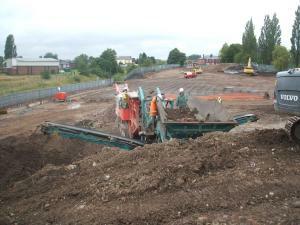 During the site works, previously unidentified asbestos contamination was encountered; following agreement with Tameside Council this was addressed by hand picking cement bonded fragments and burial of material contaminated with low levels of asbestos fibres at depth. An orange demarcation membrane was placed prior to 1.6m of clean fill being reinstated on top. Japanese Knotweed was also present on two areas of the site boundary. Rhizomes were carefully excavated and chased out prior to the installation of a Japanese Knotweed barrier. Residual Knotweed was further treated by spraying with Herbicide. A clay stank was constructed on the western boundary to prevent offsite contamination potentially migrating onto site.